Lucky for everyone (except, again, the gluten-challenged), an app called Beer Match gives us all that we could possibly need. That’s right, just like it can now get you rides home or show you where the nearest public bathroom is, your phone can help you take taste to a whole new level and enjoy your beer in never-before-seen ways. It doesn’t really come as a surprise, as we continue to use our phones in innovative ways every day. AlchemyBet, the proud owners of Pocket Fruity, have said that we now use our phones everywhere from in church to at school and at work, and we’ve all seen those brilliant souls who walk into the streets, eyes glazed over at their phones, nearly colliding with oncoming traffic (this is a real thing, I just watched the other day!). Luckily, with Beer Match, your phone isn’t just a distraction; it’s a powerful tool that helps you get the most out of your meal and the brew you choose to drink it with! 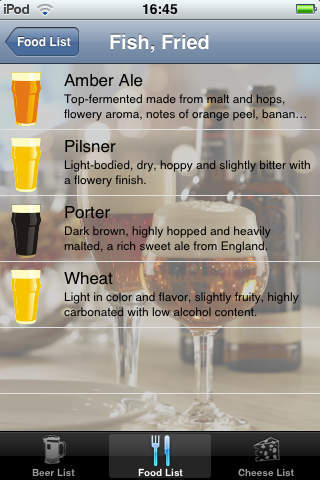 The way it works is you select a food from the list of over 500 foods already on the app, and the app then generates a list of beers – kinds of beer, not brands – that go well with your selection. If you find yourself on the other end of the line, beer in hand and wondering “goodness, what should I eat with this auspicious ale? 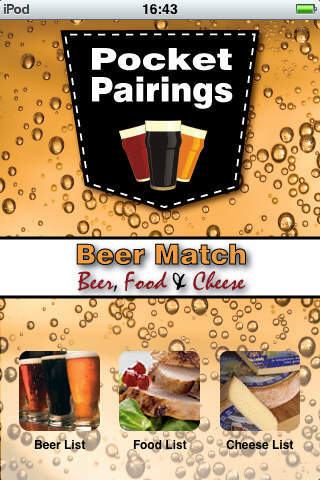 !”, you can use the app to find food that match the beer you have at home too. Major bonus: the fact that you don’t even need an internet connection to use it. Once you’ve downloaded it, all information is stored locally on your phone so you can look up great beer and food pairings no matter what pub, restaurant, or microbrewery you’re in. Even if it’s a secret sneaky restaurant underground… or you decide to have dinner in your basement. The app costs $0.99 on the iTunes App Store, and its developers have also made mobile apps for other pairings such as wine-and-food and wine-and-cheese. Really, an app for every palate and pairing.